5/250 is part of the 2016 Super Treasure Hunt set and 5/10 in the HW Race Team series. The Spectraflame blue car sports lots of white stripes and graphics as well as a red & white stripe on the hood. The hood also has the Hot Wheels Racing logo and “10” in white. The sides are decorated with red, yellow, blue and white graphics with “10” and the Hot Wheels Racing logo. “TH” appears in red on the sides and in white on the trunk. 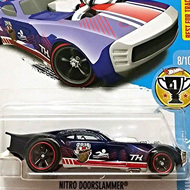 The car has a blue tinted windshield, a dark gray interior, red Real Rider Exotic wheels, and a chrome plastic Malaysia base. 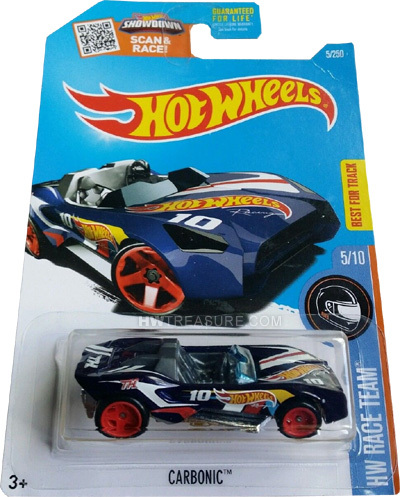 This vehicle can be found in mix “Q” of 2016 Hot Wheels mainline cases. The Carbonic made its debut in the 2014 HW Off-Road – Stunt Circuit series. It is a unique design of an open-top turbocharged roadster.